Melania Trump’s outfits have garnered criticism and caused some to speculate that she chooses certain styles to make statements— but she told reporters in Egypt that she wishes people would stop paying attention to what she wears. 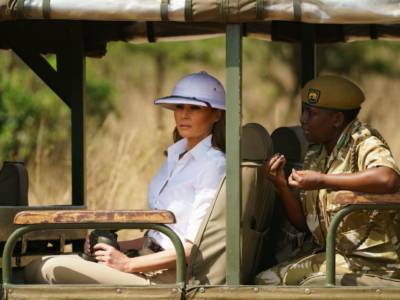 The first lady wore a white pith helmet on her tour of Africa that many thought was an offensive symbol of colonialism. The style was frequently worn by European travelers and explorers visiting areas such as Africa, Southeast Asia, and the tropics in the late 19th Century, and by military personnel from countries such as Britain, France, Spain, and Italy while commanding colonial armies. Trump has previously faced criticism for wearing a jacket that said “I really don’t care, do u?” while visiting immigrant children detained at the US border and for wearing $625 Manolo Blahnik pumps to visit the site of Hurrican Harvey.